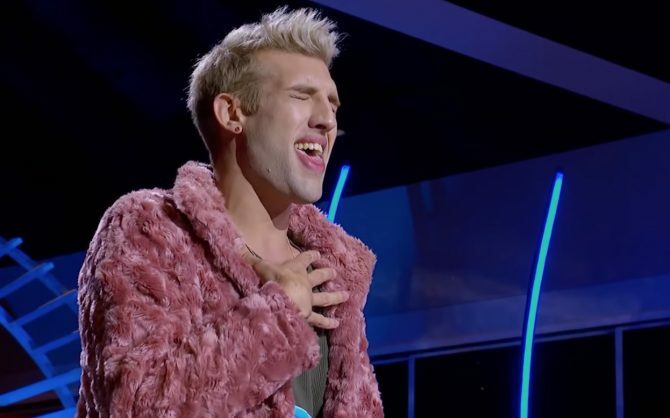 One week after American Idol audiences were moved by a gay church janitor’s song about finding his place in heaven, titled “Almost Heaven,” another out contestant, 23-year-old Jorgie, belted out an original jam about unrequited love… called “Heaven.” What’s going on here — what memo did we miss? “We love you just the way you are,” added Perry. I’d like to hear more singing from him in the future. He could be a totally different person in the midst of family members especially his parents. Being in the closet gives you the ability to do that with perfection. Lovely, good luck to Jorgie and the Jorgies (lol, terrible band name imo). Beautiful song, beautiful voice and beautiful trio. I wish them the best in idol. Same goes to our earlier ginger boy. I hope they succeed whether they win or not. That was beautiful and he seems like a sweetheart. You know this fellow spent many a night in his bedroom in tears. I am delighted that his dreams may be coming true. Good for him, I pray his dad and family accepts him for who he is and loves him just the same. He deserves that, we all do. Sad that so little of us get it. Very cute scene and great voice. Interesting, when AI came out they were openly homophobic and mocked and ridiculed LGBT contestants. Exactly what I was thinking. They’ve come a long way. I may have to give them another chance.